Looking for a place to enjoy some food with your wine? Yes, the main event at these establishment is usually the wine and wine tasting, but food is also served. I'm sure they'll sell you a few bottles of your favorite, too. Downtown Scottsdale. Reasonably-priced wines, a menu with burgers, sandwiches, salads and a nice variety of plates to share; there's even a kid's menu. Wine dinners, Sunday brunch and live music. A great spot for people-watching in Old Town. In the West Valley you can stop into Betty's Nosh in Glendale for a glass of wine, including some Arizona wines, and a nosh. Love mushrooms? This is the place! Check the calendar for the schedule of live entertainment and happy hour specials. From Kazimierz World Wine Bar: "comfortably plush sofas & chairs in vineyard colors, stone walls softened by candlelight; wooden wine casks evoke the feel of a European wine cave; subtle lighting; interesting mix of jazz, latin & world beat music at levels that don't strain conversation!" Recipient of the 2001, 2002, 2003, 2004, 2005 & 2006 Wine Spectator Award of Excellence and the 2003 Wine Spectator Best Of Award of Excellence. Locations in Phoenix, Gilbert and Tempe. The original location in Phoenix opened in 2001. 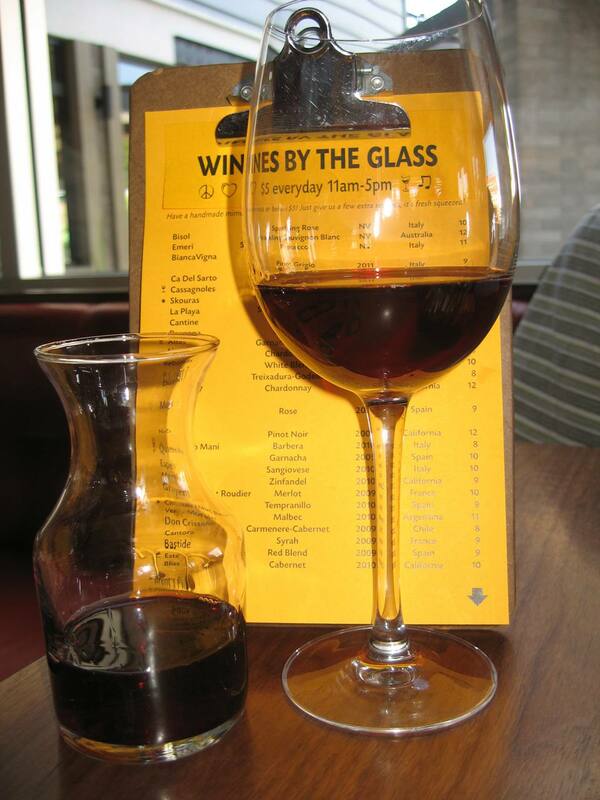 Every day before 5 p.m. they offer a wide selection of wines by the glass for $5 (last updated Feb.
2015). Paninis, salads and the popular cheese and butcher block boards are on the menu to pair with your wine. A wine bar that offers 30 continuously rotated wines by the glass along with beers, cheeses, chocolates, and cigars. Biker friendly, dog friendly. Scottsdale. A good variety of wine flights from which to choose and, of course, the food to go with them if you'd like. Downtown Chandler. Boutique wines, a full menu and happy hour with tapas every day. If you want to buy a bottle of wine, one of these stores are sure to have what you need. Although some of these have wine tastings and events, they are primarily retailers, as opposed to cafés. From the web site: "Every year for the last 18 years AJ's Fine Foods has brought to you a selection of 50 or more wines retailing under $11.99. This year is no different. All of our Cellar Masters have sampled and rated wines with great taste, structure and value....Wines from South America, Australia, New Zealand, Italy, Germany, and California are represented on the list; which includes varieties such as Shiraz, Cabernet Sauvignon, Pinot Noir, Chardonnay, Viognier, Muscat, Riesling, Gewurztraminer and Sauvignon Blanc." A J's Fine Foods has eleven locations in the metro Phoenix/Scolttsdale area. Locations in Carefree and Scottsdale. Wine tastings and events. Named one of America's top 50 wine stores by GQ Magazine in April 2004. Scottsdale. From the web site: "Su Vino Winery, Scottsdale, is a family owned and operated winery located in the Arts District of Downtown Scottsdale. Su Vino is an award winning winery with a twist, not only have we won over 36 medals for our wines, but we are the first winery in the Scottsdale area and the first to offer customers the opportunity to have wine made specifically for them and their palate." From the web site: "...we have created a comfortable, affordable and fun way to buy wines, based on flavor and body. We guarantee our wines and stand behind each bottle we sell. Come and experience for yourself at one of our upcoming wine tasting events!" One location in Arizona in North Phoenix. From the web site: "Wilfred Wong, our BevMo! Cellarmaster, and one of the most prolific and experienced wine judges in the U.S., describes and rates most of the wines offered in the stores in printed signs posted by their respective bottles, guiding customers in their selection process. He currently tastes over 8,000 wines annually and judges in over a dozen major wine competitions each year." Eight locations in the Valley. From the web site: "Our buyers travel the world visiting remote villages, centuries-old factories and foreign bazaars searching for unique products to offer our customers. Baskets from Bali, chocolates from Belgium, pottery from Portugal, and wine from around the world." Seven locations in the Valley. From the web site: "For those of you who don't know us well yet, our initial reason for being in the business of selling wine is we want to offer our customers good wines for a great deal. Whether it's a very well priced Chard from Australia or a robust red from Chile, we want to be the ones who offer those options at an outstanding value." Nine locations in the Valley. Trader Joe's is a grocery store that is a favorite of those who are looking for vegetarian, Kosher, organic and other specialty foods. From the web site: "We are committed to having the best wine selection with an emphasis on fine wines. This differentiates us from many retailers in the United States who specialize in one geographic area or price category. Our typical store carries more than 8,000 different wines from every wine-producing region in the world." Phoenix, Tempe, Gilbert, Scottsdale, Glendale, Goodyear. A large selection of wines, including a large display of locally produced Arizona wines. Phoenix, Chandler and Tempe locations. All prices and offerings are subject to change without notice. A Pint of Guinness or Some Corned Beef & Cabbage!